Great news, friends of the Western World and freedom. A French newspaper, France Soir, has published the 12 drawings and a main page with it's own drawing of Jesus, Bhudda and Mohammed. 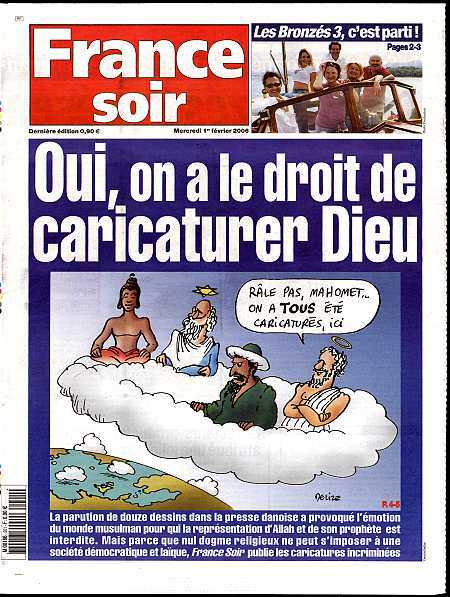 Jesus in the drawing says to Mohammed: "Don't be angry, Mohammed, we have all been in cartoons." No religion may be permitted to enforce it's dogmas on a democratic and secular society, where religion belongs to the private sphere. The Arabs better get themselves a large supply of flags to burn. I for one will invest some money in flag producing companies. 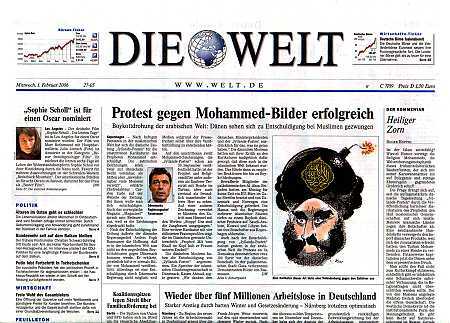 A big German newspaper, Die Welt, now also has printed some of the drawings. Also newspapers in Spain, Finland, Iceland and Holland are supposed to have printed the drawings! The game gives me a lot of happy,and when i miss the 2moons dil i will go to play it,so I often go to earn the 2moons gold to be strong.Sometimes my friends will give some 2moon dil to me and they also take me to play the game. I began to no longer satisfy with the present equipment, so I have to find a friend, a friend gave me a thing.I would not go to buy 2moons dil,i like the game very much.If you want to play it,join us and then cheap 2moons gold.Please do not hesitate to play the game. Do want to know the magic of online games, and here you can get more Pirates of the Burning Sea Gold. Do you want to have a try? Come on and potbs gold can make you happy.You can change a lot potbs Doubloon for play games. Playing online games can make much potbs money. And you can use the buy potbs Doubloon do what you want to do in the online game.